If you received our last newsletter in November you'll know that, although it was very wet, the weather should have allowed printing of The Colours of Rome to get under way. In the event of course, we have had a very cold (for us) winter, and it has been hard to get the temperature outside in the garage (where the press lives) up to a sensible level. Progress has been mighty slow and it is only in the last month that I have managed to get all the printing done of the book that forms part of each copy of The Colours of Rome. All eight sheets have had to go through the press four times, three of them five times, and they are all now folded and gathered ready for binding. All in all it has gone reasonably well, and at our website I have put together a photo diary of work so far: from the home page, select the 'at work' button on the left and then click on the icon for this title. The next task I must turn to is printing the captions on the 'paint-outs'. Each copy of the book contains a portfolio of twenty sheets, each of which has been painted with one of the colours that John Sutcliffe has chosen as representative of the colours that appear in Rome's centro storico. There will also be a swatch card, bringing all twenty colours onto one sheet, and I have to prepare those for the binders and print the guide-lines and captions on them. 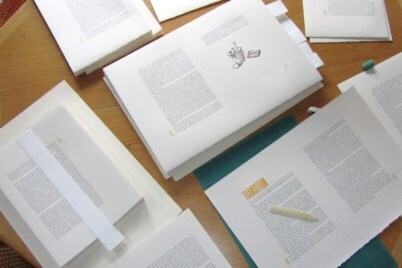 Finally I have the paper announcement to print - I hope that can go out next month - and the labels that go on the nine bottles of pigment in the de luxe copies - oh, and the spine labels of course. There will be 99 standard copies and 25 de luxe. The price per copy will be about £190 and £350 respectively. I'm pleased to say that this is now well advanced. Leslie has completed a dozen fine images. The paper is on order from the Velké Losiny mill in the Czech Republic, and the type is waiting on galleys in the print-shop. As soon as The Colours of Rome is done I shall move swiftly on to print the eight pages required for Stockholm Reflections. This book is without doubt principally about Leslie's images but I'm looking forward to printing the 14pt Joanna on the Losiny hand-made paper. We have chosen a pale-blue paper that the Czechs make, and there will be headings in blue printed in the 24pt bold version of Gill Sans. The 8pp section will be sewn into a zig (or possibly a zag) in the zig-zag that the book will make, within a conventional case, and the whole book will come in a solander box with a further image by Leslie on the binding of the book. There will be just 95 copies, of which 89 will be for sale. Pricing to be announced.